ASTM A307 Hex Tap Bolts are a low carbon, hex head bolt with a machined point and are fully threaded from under the head to the point. 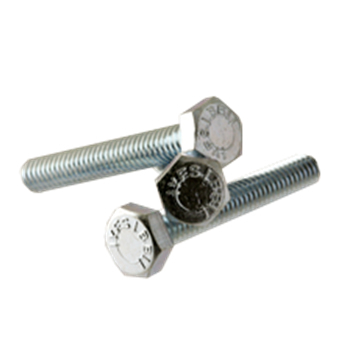 Fully Threaded Hex Tap Bolts are to be used in drilled and tapped holes which are threaded full length. Grade 5 Hex Tap Bolts are popular in automotive and truck repair operations. They are widely used to mount motors to machinery. We stock ASTM A307 Grade A and Grade 5 fully threaded hex tap bolts in plain and RoHS compliant zinc clear. Fully threaded hex cap screws are also available in stainless steel below or in the Hex Cap Screw section of our Online Store.